Afghanistan Ministry of Commerce and Industries has welcomed India’s USD 156mn investment decision to development Chabahar port. The Ministry’s spokesperson, Mosafer Quqandi, said Afghanistan would undoubtedly benefit from India’s investment in Chabahar. Regarding the port as profitable for India, Quqandi said the port would be advantageous for the entire region. He added that Iran had allocated 54 hectares of land to Afghan merchants for transiting their products based on a MoU signed between Kabul and Tehran. He also noted that Afghan high-ranking officials headed by Abdullah Abdullah visited Chabahar encouraged Afghan merchants to use this port for export and import purposes. The Chabahar port in southeast Iran will enable India to expand their footprint in the region, notably Afghanistan. A recreational park in Sharan city of Paktika has re-opened. The park was previously used, but it was never reconstructed. 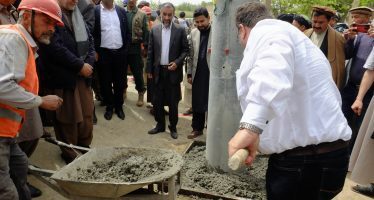 About 14,000 locals from villages of Hazar Sumuch and Kunjak in Takhar province will benefit from a reliable energy supply.